Burning Wins does not bring fancy graphics, unique characters or bright, flashing lights to the table to draw you in. 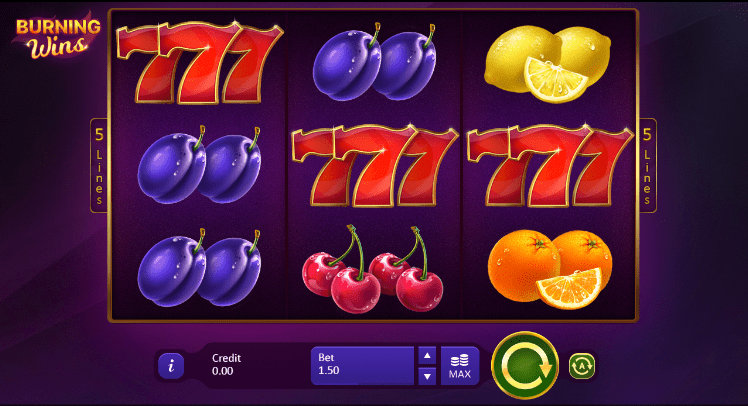 After all, it is your standard slots casino game with fruits and a 3x3 set-up. So what makes Burning Wins fun to play? It smartly distributes bonuses to players throughout the game and in various ways. Additionally, the flexibility to choose which currency you’d like to bet in allows for myriad users to not only play Burning Wins, but to cash in on their luck as well. Smooth, clean and to the point, Burning Wins isn’t about style, it’s about substance and it brings the substance in spades (or in this case, lots of different fruits). Offering over 40 slot-based games, Playson is a versatile and experienced developer that has been doing this and doing it well for a long time. They have a vast array of partners and appear on over a dozen platforms, giving them vast reach. Playson knows its audience and does a great job providing different options and avenues to play a slot genre that has been covered back to front. From action-packed, beautiful games to bonus-laden games that provide nothing but wins, Playson has done it all. Go on this site to check out more games! Burning Wins is your standard 3x3 slot game: you match as many symbols on the three lines as you can; the more you hit simultaneously, the bigger your win can be. One aspect of Burning Wins that is likely to grab players are the vast bonuses offered through the game and the various ways those bonuses can be obtained: through reloads, referring new players to the game, for hot streaks, as part of signing up to play and even a couple deposit bonuses. Being a traditional slot game, it does a great job of bringing in players with additional ways to win and to win for free. With up to 5 bet ways, players can bet anywhere from 0.10 to 100 in currencies such as the U.S. dollar, the British pound or the Euro. If you want bonuses and straight-forward slot-based action that will allow you to get in as many bets as possible in a short period of time while providing a big chance to win, Burning Wins is where it’s at. Fruits may be common place, but so are the myriad ways to win that Burning Wins provides. So all you have to do is keep clicking away and see the bonuses (and your winnings) stack up! If you prefer more complex and flashy games why not try out Burning Desire.